More than 500,000 web pages talk about Patrick Dixon and his ideas, with cumulative TV, radio and press audience reach estimated to be more than 450 million. He has been ranked one of the 20 most influential business thinkers alive today. A great Futurist keynote speaker - keynotes at over 1000 major corporate events. Author of 16 books (over 620,000 books printed in 35 languages). "Dr Dixon lives in 2020 and sees tomorrow as history". Discuss your own event today: phone or e-mail Patrick Dixon now. Read FREE SAMPLE of The Truth about Almost Everything. 20 year proven track record as a reliable guide to future trends for hundreds of the world's largest multinationals - check for yourself. Patrick Dixon is Chairman of Global Change Ltd, author of 16 books on global trends including The Future of Almost Everything, and has been ranked as one of the 20 most influential business thinkers alive today (Thinkers 50). Dr Dixon has spoken to audiences in over 60 nations and is one of the world's most sought after keynote speakers at corporate events. He is often described as Europe's leading Futurist with a long track record of success in industry forecasting, and has worked with over 400 of the world's largest corporations. Clients include Google, Microsoft, IBM, Bank of America, BNP Paribas, Credit Suisse, KLM / Air France, BP, ExxonMobil, General Motors, General Electric, Siemens, World Bank and many governments. Patrick Dixon is also co-founder and director of Global Innovators Ltd, accelerating smart companies and entrepreneurs into global markets. Patrick will bring a customised Keynote presentation on his own Mac. Think of theatre rather than a traditional lecture. Patrick's Keynotes are highly visual with many images, animations, video clips - these are short, embedded video elements (almost always without sound). Content is created in close consultation with event organisers, adapted precisely to theme and audience. His Mac can sit on the technician's desk with all their other equipment. There is nothing for the technicians to do during the keynote itself. Setup time usually takes less than 5 minutes, including sound check, with good preparation on both sides before arrival. Dr Patrick Dixon is often described in the media as Europe's leading Futurist. As one of the world's best keynote speakers, he gives up to 50 highly customised keynotes a year on a wide range of global trends in every industry. Many Futurist keynote speakers give wild and sensational views of a future that never happens. In contrast, over the last 25 years he has been one of the world's leading authorities on global trends, working with over 400 of the world's largest companies, delivering a wide range of industries and clients including Google, Microsoft, IBM, Hewlett Packard, Phillips, GSK, UBS, RBS, Airbus, BP, Shell, Nokia, Siemens, AT&T, Allianz and Prudential. He is author of 16 Futurist books including There Future of Almost Everything which contains hundreds of Futurist insights. He has given Futurist keynotes and presentations to conference audiences in 53 nations. Need a world-class Futurist keynote speaker? Phone Patrick Dixon now or email. Cumulative audience reach / influence of TV / radio / press estimated to be more than 450 million. This does not include visitors to over 500,000 web pages about Patrick Dixon on other websites, plus 15.5 millionunique users of this website with 43,000 Twitter followers and 6 million video views, mainly on Patrick Dixon's YouTube Channel. Discuss your own event or media enquiry today: phone or e-mail Patrick Dixon now. From a UK government think-tank, to the TV studio in his home, then flying to Dubai, giving a keynote to clients of Fedex / Times of India, ending with reflections on Middle East and geo-political tensions. What does a Futurist actually do? Dr Dixon is contacted by TV, radio and press journalists around 200 times a year (up to 70 times in a single day) for comment on major issues and trends. Here is a short film made as a result of one of those calls. Read what others are saying.... in many different . A Google search in January 2014 showed hundreds of thousands of different web page listings referring to "Patrick Dixon", of which the vast majority are about the creator of this Futurist site. Numbers of sites identified varies a lot from day to day on Google. But even Google is an incomplete index. In addition there are many tens of thousands of other sites that refer to ideas or videos presented here. The interest is accelerated by more than 15 million different people from just about every country in the world who have visited the site (see statistics). Pages about Patrick Dixon are in many different , including keynote conference speeches on video, and BBC / CNN reports. 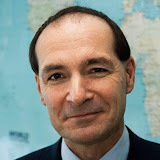 Patrick Dixon has given keynotes on a wide range of trends to audiences in North America, Central America, Latin America, Western Europe, Central Europe, Eastern Europe, Baltic States, Scandinavia, Africa, Central Asia, South East Asia and Asia Pacific. Click on the photo to get loads more you can use in articles, promotion of corporate events. Watch Patrick Dixon in action on stage and in seminars / workshops / executive education. Click on the image to enter public Picasa Album. If you are looking for VIDEOS, press here. Search for the world's most influential business thinkers? Dr Patrick Dixon was ranked as one of the top 20 most influential thinkers alive today, in the Thinkers 50 global executive survey published in 2005 (The Times - UK). Number One was Michael Porter, followed by Bill Gates. Patrick Dixon was also ranked in the top 50 in 2003.
Who is the most important living management thinker alive today? Need a world-class business keynote speaker? Phone Patrick Dixon now or email. Travel is redundant, anti-globalisation protests are mounting and academia is ruled by 'shallow' gurus. Chris Bunting looks forward to 2010 with 'Europe's leading futurist' Patrick Dixon.